Bob Salley’s 3-part release Ogre is getting a collected edition through Source Point Press that’ll be released at the end of March so it was a pretty good time to delve into his creation. The titular Ogre finds himself trapped in a prison cell, chained to a human corpse and haunted by its ghost and that’s only the start of his problems. A siege on the castle gets the prisoners caught up in a collected quest for survival and the Ogre is less than eager to leave the confines of the castle jail…….but safe to say he’s convinced otherwise. Outside the cell it’s a life on the run with an army closing in and a host of monsters more than ready to feast on the small band of escapees. Along the way the identity of the true monsters swings from the grotesque shapes hiding in the shadows to the very human faces that lead their own attacks on anyone that gets in their way but that doesn’t stop the quest closing in on it’s final goal. Bob has thrown together a glorious set of characters who battle their own reluctance as much as they battle each other but that helps build the layers of a well-paced story with more than it’s fair share of surprises. Team that up with the Shawn Daley’s art that embodies all the fantasy & battle elements with an equally impressive level of detail to the writing and you’ve got a recipe for greatness. 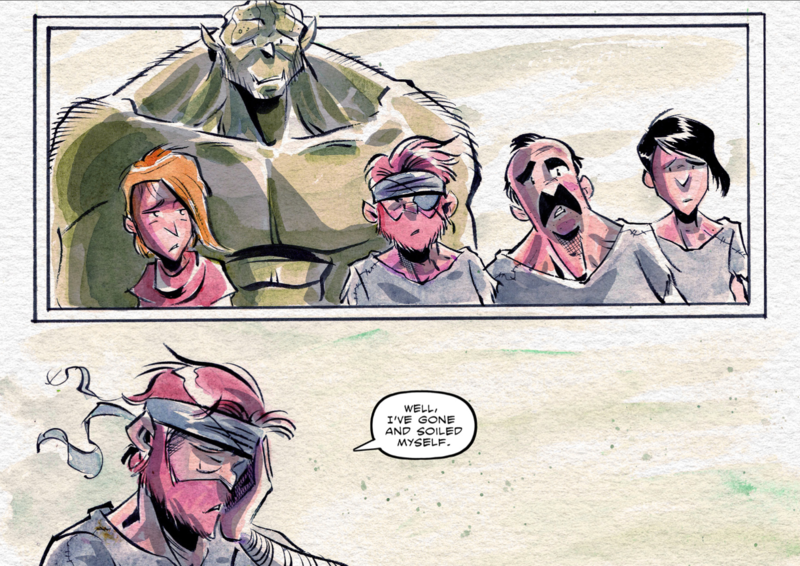 The three issues of Ogre end up becoming an intriguing blend of trying to find a purpose and trying to escape that same purpose but the reluctance at our main characters core gives way to a higher purpose and sense of duty that helps build momentum behind his quest. The casualties along the way are a gut-punch and the weight of the next challenge doesn’t go unnoticed but thanks to Bob & Shawn the story revels in its bittersweet edge to embrace all the ups & downs the characters face along the way. Brutal & bleak in places but the subtle sense of a common goal among the main characters gets under your skin from the beginning to make sure the series is a page-turner. Head over to the Source Point Press online store to get your hands on the collected edition and keep tabs on their Website, Facebook & Twitter pages for more info on the other releases they have on the way. This entry was posted in Comic Reviews, Indie and tagged Bob Salley, Ogre, Shawn Daley, Source Point Press by G-Man. Bookmark the permalink.